Music is a powerful, unique form of communication that can change the way pupils feel, think and act. It brings together intellect and feeling and enables personal expression, reflection and emotional development. As an integral part of culture, past and present, it helps people understand themselves and relate to others therefore forming important links between the home, school and the wider world. The teaching of music develops pupils’ ability to listen and appreciate a wide variety of music and make judgements about musical quality. It encourages active involvement in different forms of amateur music making, both individual and communal, developing a sense of group identity and togetherness. It also increases self-discipline and creativity, aesthetic sensitivity and fulfilment. All children at Longmoor have the opportunity to enjoy musical experiences through listening, singing, movement and dance and by playing tuned and un-tuned percussion. We follow the Charanga Music School scheme of work to teach music and give pupils the best opportunity to develop their knowledge and skills in this area of the curriculum. In 2017-18, Year 5 pupils will have the opportunity to learn to play the ukuele. Many children also have individual or group lessons taken by the Music Partnership Team on a variety of instruments. We are also very pleased to offer children in KS2 to chance to play drums through our link with the DRUMBA company. Rocksteady Music School - Make Some Noise! 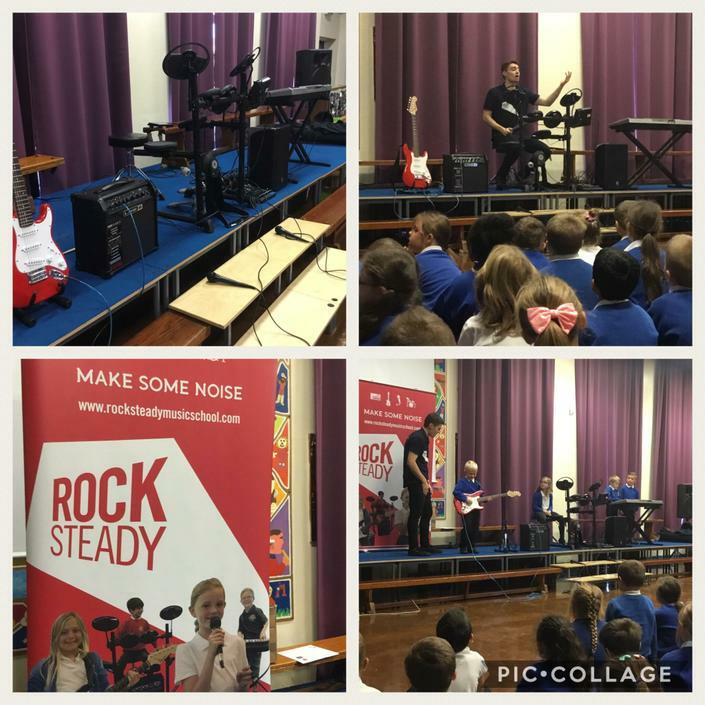 We are very excited to bring Rocksteady Music School to Longmoor Primary School this year! Their inspirational team of trained musicians come in and demonstrate the joy of making music in a band. Once parents sign up, the children take part in weekly rehearsals during school time, with one of the band leaders. They teach the bands their favourite songs to rehearse and perform to parents and guests. At the end of each term, the children take centre stage. They get to perform their chosen song in a live show to parents, guests and their friends. It’s a fun experience that builds personal confidence and makes school cool. Music making Try out this super website and start making music! Music Mixer Make and record your own songs and dance it up!